Cybex International produces premium commercial fitness equipment designed to deliver unparalleled results for exercisers from first-time users to professional athletes. The company’s dedication to exercise science, through the Cybex Institute, leads the fitness industry in providing scientific basis for the development of exercise machines that enhance human performance. With over 90 patents, Cybex equipment is innovative in design, durable in structure and engineered to be biomechanically correct to produce optimum results with minimum stress on the body – this is the Cybex Advantage. A Commercial Large Conclude cross coach created to focus on the reduce physique. The 750A Arc Coach has all of the characteristics of the Complete Physique Arc Trainer without the Arm movement. Common with coaches and trainers, the Lower Entire body Arc is often picked because it provides extra exercise flexibility. A Commercial High End cross trainer designed to concentrate on the lower body. The 770A Arc Trainer has all of the features of the Total Body Arc Trainer without the Arm motion. Popular with coaches and trainers, the Lower Body Arc is often chosen because it gives added workout flexibility. Raised console iconography and color allows easy identification of the main controls both by color, large buttons and text for older users, plus raised iconography for visually impaired users. The 625A Arc Trainer® contains the great leg movement and the different other great highlights of the 625AT Comprehensive Body Arc Instructor. Designed to think about the lower shape, this Cross trainer is used often by facilities looking to provide variety for their own users. The New 525 Series offers the industry leading Cybex commercial-level quality you’d expect, the durability and reliability you require and a new easy-to-use, centralized, console designed to provide an intuitive, accessible layout for users in managed and unsupervised environments. The 12-piece Total Access line not only meets, but exceeds Inclusive Fitness Initiative (IFI) standards. Providing fitness facilities with a complete cardio and strength solution that accommodates exercisers of all abilities to train in a safe, controlled environment. 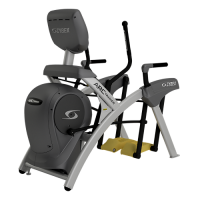 A Commercial Quality cross trainer built to concentrate on the bottom body. The 770A Arc Trainer has most of the features of the total Body Arc Trainer but without the Arm motion. Favored by coaches and training organisations, the Lower Body Arc is normally chosen because the application gives added workout.